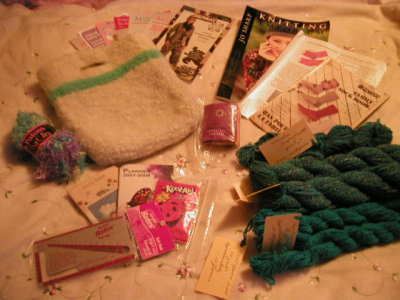 Look what I recived from Karen in Canada! Handspun yarn! And the lovely sockbag she made herself. Then we have a funny Patonyarn. Then we have tea in 9 (!) flavours. The package smells lovely!!! Yum-yum! 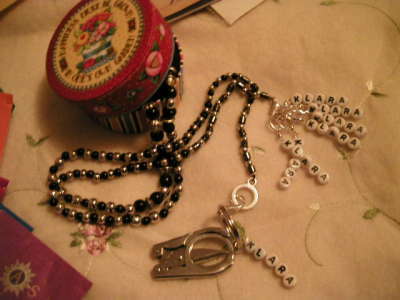 Then I found a little box... With a chatelaine and a scissor! :0) Then look at all the stitchmarkers; in my name! But wait... its more to come! Look, look! It is a bag number two toooo! 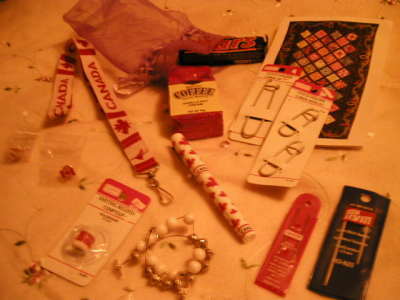 In a little lilac bag I found this: Vanilla Nut Cream Coffee, Stitchholders, a Cable Stitch Needle, wool needles, "a knitting register compteur", chocolate, 2 Canada-pins, a Canadapen and a Canada keyholder. 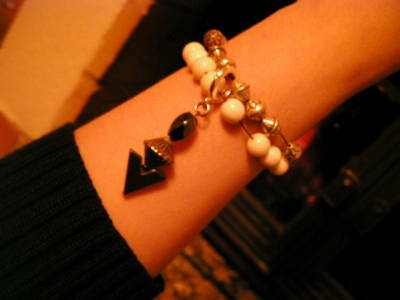 And... a beadcounting bracelet Karen did for me! Thanks you so much Karen! I am so grateful!